Grapple, swing, release. Grapple, swing, release. This is the mantra of Ascent, the three words you must take to heart if you are to succeed. The way is hard, and hesitation is death. Choose wisely. Why am I getting all Zen? Two reasons. One, Ascent is a deeply immersive and addicting game, so be prepared to have your mind sucked into a piercing dot of red-hot concentration. Two, Ascent is really freakin’ hard, so it will help to concentrate on breathing and relaxation if you want to prevent yourself from throwing your iPhone against a wall. Ascent has a remarkably elegant mechanism at its core. You control a little gray ball with a grappling hook, and you want to climb as high as you possible can. Above you are a variety of mines, just hanging out like ripe fruit. You can grapple onto these mines and use them to swing the ball up, but attaching the hook arms the mine, so wait too long to release and BOOM! Game over. To prevent this messy shrapnel-filled end, you have to release at the precise moment to grapple onto another mine, always trying to climb higher. The swing is the thing, so you eventually get good at timing the grapple and release technique while learning to anticipate where the next mine will be, but it gets harder, because there is more than one type of mine out there. Some of them do good things, so of them do bad, but all of them still require an enormous amount of vigilance and timing. If you want to make life a little easier for yourself, trust me on this, just try to avoid ever touching the mines. Get good enough, and you may even be able to climb all the way into outer space. I wasn’t anywhere near skilled enough to even ascend from the underground, but that didn’t stop me from enjoying the explosion-filled goodness of this game. I know it sounds complicated, but Ascent really generously rewards those with keen reflexes. It’s the kind of game that devours hours of time with the blink of an eye in a deeply satisfying way. As you swing from mine to mine, you fall into a kind of natural rhythm that is simultaneously soothing and exhilarating, as every new swing is fraught with peril. The graphics and sound aren’t stellar, but they’re really just a neutral background for a highly addictive game mechanism that is smooth as butter. If you’re looking for a fun reflex challenge that’s easy to pick up, but hard to master, look no further than Ascent. 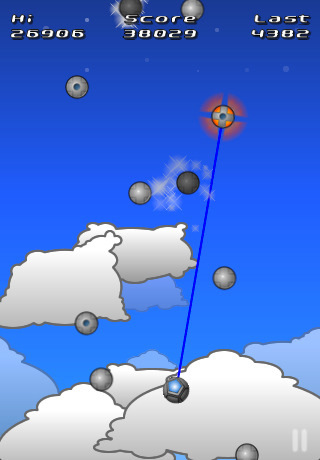 AppSafari review of Ascent was written by Tracy Yonemoto on April 21st, 2010 and categorized under Action, App Store, Fun, Games, Physics Based. Page viewed 2892 times, 2 so far today. Need help on using these apps? Please read the Help Page.